What is the struggle for? One of the most successful political movements on the 20th Century was the Civil Rights movement. It brought together millions of Americans, with different views and backgrounds to address a specific injustice. The movement had tangible outcomes in the form of the Civil Rights Act and the Voting Rights Act. We can learn from this when building a left wing movement in the UK. For example, having a clear goal that can unite people. This is one reason why the campaign to make Jeremy Corbyn leader of the Labour Party worked so well; having a specific goal brought together people with a range of distinct and indistinct political opinions. The Corbyn campaign was supported by people who felt left wing and wanted a broader change in society. Corbyn was able to unite this desire (a desire for people disagreed on many details of politics) around a specific outcome: becoming Labour leader. Completing this goal is not the end of the struggle. We have a long way to go before any meaningful social change in enacted. This leads me to ask: "what is Corbyn Labour and the wider left wing movement behind it trying to achieve?" What is the struggle for? It's not enough to say "make Corbyn Prime Minister," what do we want him to do after that? What are the tangible outcomes? One answer is to end neoliberalism, the political ideology that believes free markets bring about the optimum allocation of resources and that it is government's role to make markets freer. Getting rid of neoliberalism is a good idea, but what ideology do we want to replace neoliberalism with? Socialism has become a byword for opposition to neoliberalism. Do you want to nationalise the railways, spend more on the NHS, increase benefits, beef-up trade unions and invest more in economic development of poorer areas? Then you're probably a socialist. However, being someone who is more economically left wing than Tony Blair is not what socialism used to be. What I described above is Keynesian economics and fairly timid Keynesianism at that. From what I can see, the economic program of a future Corbyn government would be to return to the policies of Harold Wilson's Labour government. This would make a Corbyn's government the third most radically left wing Labour government out of five. That is not what I thought was being offered when Corbyn stood to be party leader. Corbyn clearly wants to change Britain's foreign policy, or more accurately the entire way that Britain acts in the world. During his years on the backbenches, foreign policy is where Corbyn concentrated his efforts, mainly through solidarity with various oppressed groups around the world. Certainly a Corbyn government would have a radically different foreign policy to any previous British government. Britain is not the international heavyweight it once was and now we have lost our ability to influence EU foreign policy our influence is diminished further. I am not sure what global impact the Corbyn government will have, beyond a greater capacity to make gestures of solidarity. If Corbyn was PM would he be able to stop the Syrian Civil War? A focus on foreign policy would overlook the crucial role of domestic politics. What will a Corbyn government do to fix the problems in Britain? I am worried that the objectives of socialism has become changing the people at the top of the machinery of state to be nice people and then let them fix social problems with said machinery. This ignores the fact that the machinery itself is part of the problem, no matter who is in charge of it. We need to change society, not just put Corbyn at the top of it. The stated aim of a socialist government should be creating the conditions to transition our economy to a post-capitalist one, providing a minimum standard of living to all its citizens, reducing inequality in all its forms, addressing climate change and diminish in the power of the state wherever possible. This is what socialism should be about. This will require radical new policies that go beyond nationalising the railways, spending more on the NHS or even introducing Universal Basic Income. There are many areas we need to think about, such as how taxation, housing, unions, health, transport and work. We need to ask questions, such as who has social power, and how do we measure values? A lot of this can't be done at the Westminster level and will need a broader movement aimed at changing society instead of just changing who is PM. I am sure that Corbyn is a nice guy, but what we need to achieve is bigger than him, bigger than any person or political party. Party and government are tools to help us change society, but we need to also build new tools that are more suited to the task of improving people’s lives. We can look at the Civil Rights Movement and how we are a much more racially tolerant society now than we were in the 1960s as proof that broad social movements can change society. 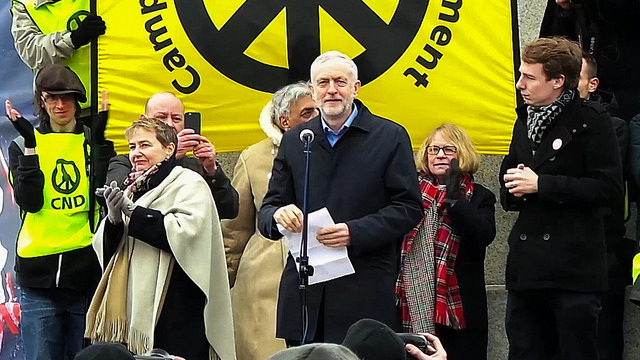 The photo of Corbyn at a CND event was taken by Garry Knight and is used under creative commons.